When I was prepping my old fenders for paint, I discovered just how weak they are. 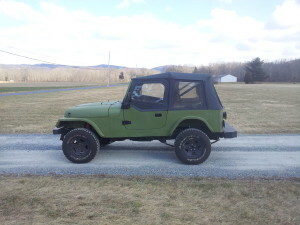 I was actually afraid that I was going to break the fenders while trying to remove some bolts. So I decided to make new fenders. 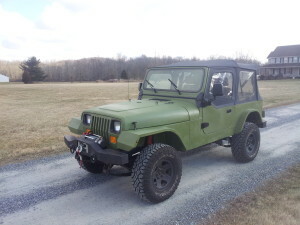 While I could have just bought new fenders, I liked the original style of the jeep fender. But I also wanted the fender to be much tougher than the original. 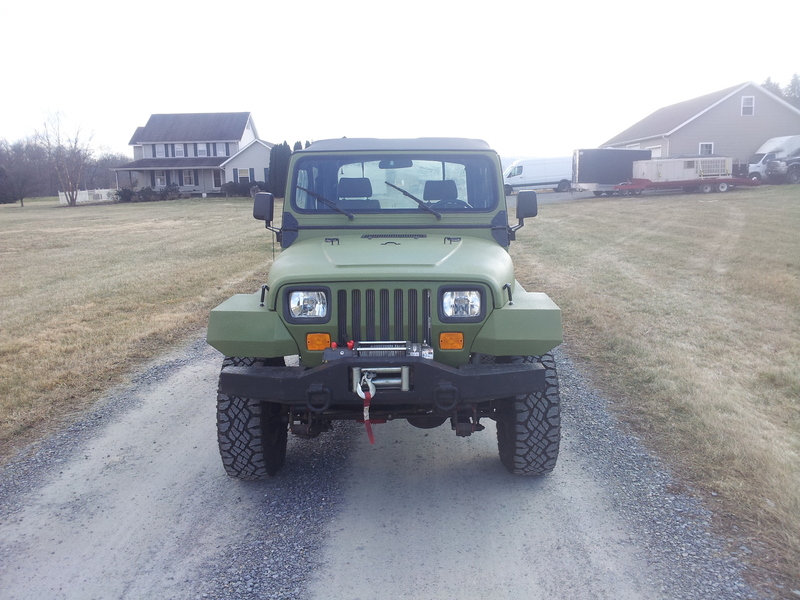 The original front end body mount is, well, underwhelming in its sturdiness. 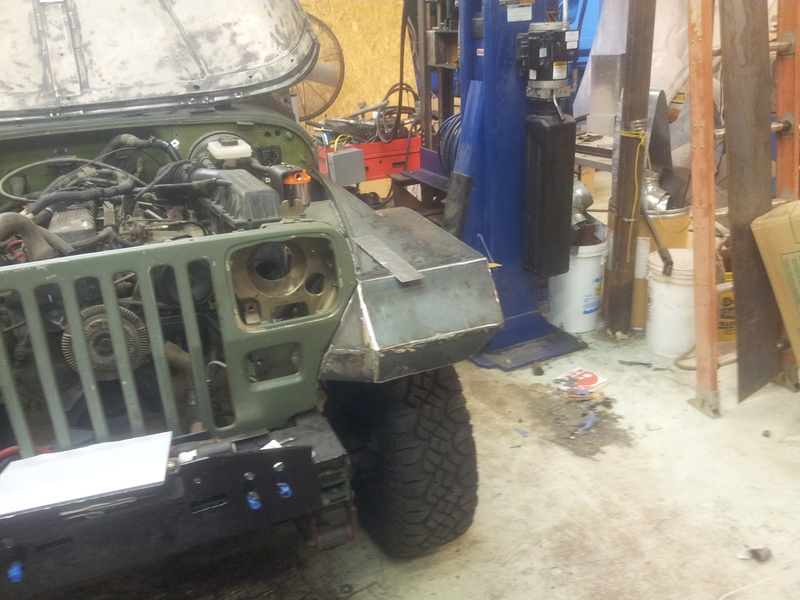 So the first step is to design a new mount for these fenders. As you can see from the picture above, the mount I used is not a normal body mount. 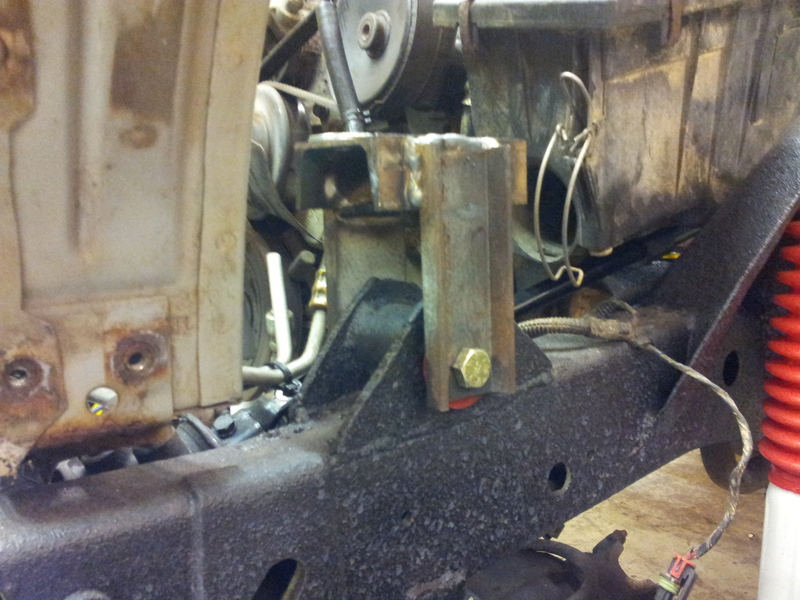 Actually, the bushing is the same bushing that the front shackle bolts into the frame. The mount is made with steel tubing. I forget the exact size of the tubing, but it was available on Amazon. 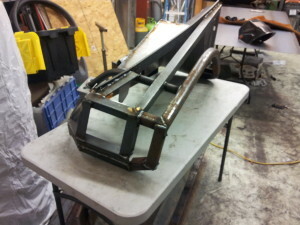 Then I used a quarter inch thick plate on each side to reinforce the tubing. The thing bolted to this mount is a standoff. There is a flat plate that is attached to the fender that will bolt to this standoff. The holes are enlarged to allow the fender to move back and forth. It will also allow me to place spacers in between these two plates in order to raise and lower the front half of the fender. Coming off the plate is a pipe. This pipe is just a ¾” black pluming pipe. The pipe comes off of the mount at an angle, then bends straight into a ¼” flat bar that follows the hood to keep out rain. 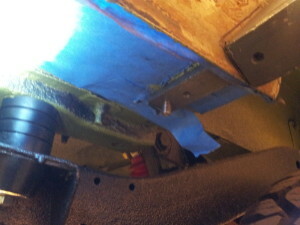 Then this pipe goes through the frame of the fender. 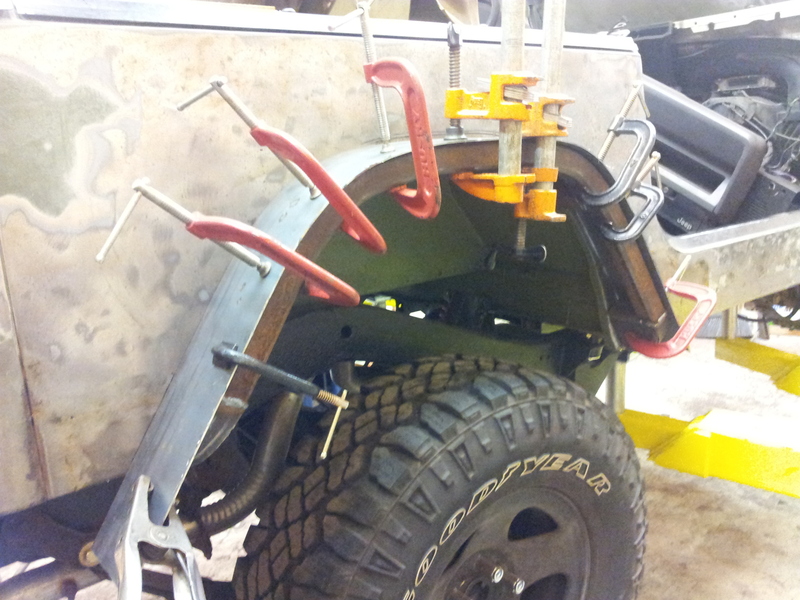 Then the pipe attaches to the flare section of the fender. The outside of the fender flare is made out of square tube steel. 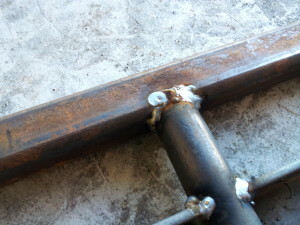 Instead of just but welding the pipe to the square tube, I drilled a hole into the square tube. Then I insert the pipe all the way into the square tube. 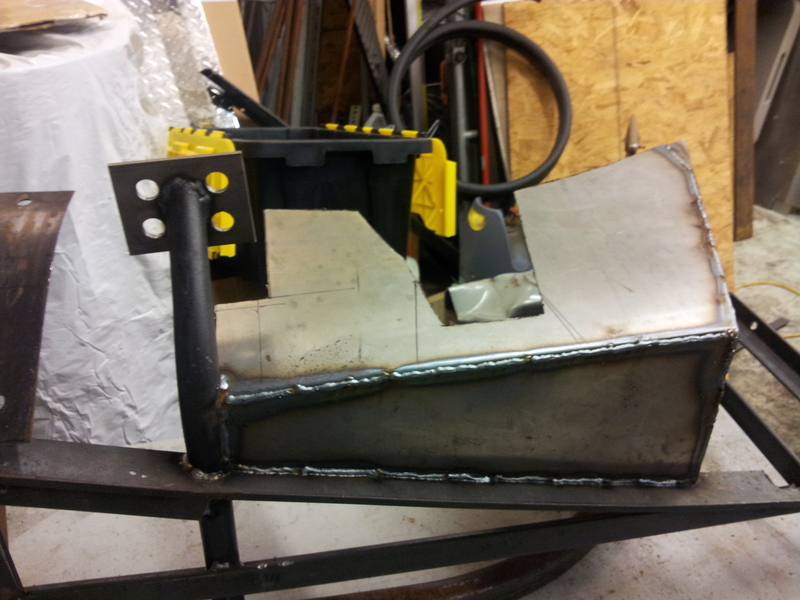 Any side impact will be delivered into the pipe without putting too much force onto the weld. I made the die out of a ½” piece of steel. I cut it using a plasma cutter, and then I smoothed it out with a grinder. 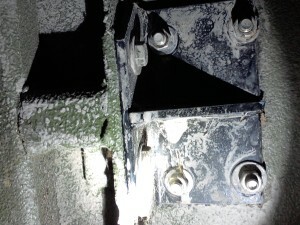 This is attached to the part of the press that moves up and down. To support the tubing that is to be bent, I have two huge pieces of angle steel. If I remember properly, this steel is 8″x 8″ x ¾”. As you can see from the video above, the press had little difficulty bending the tube. 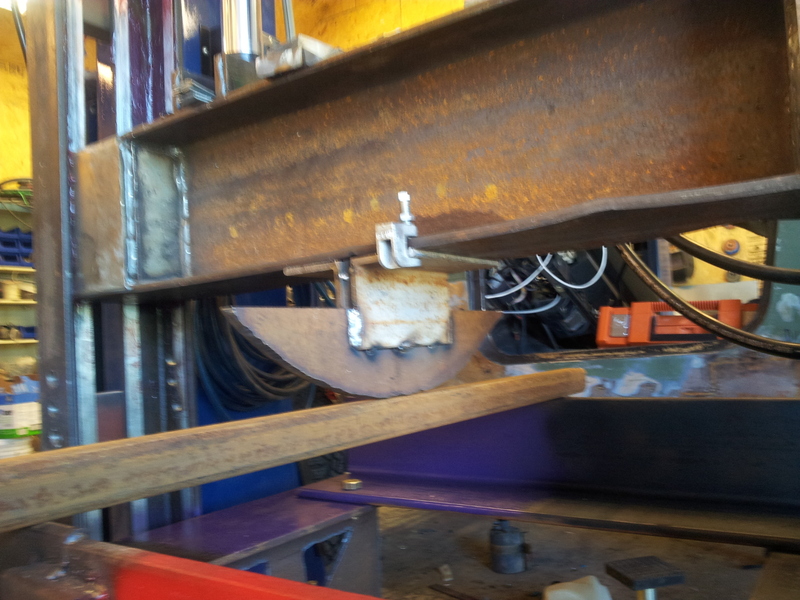 I wonder how thick of a piece of steel I can bend…. At the bottom of the fender flare, I have a radius going into the fender. 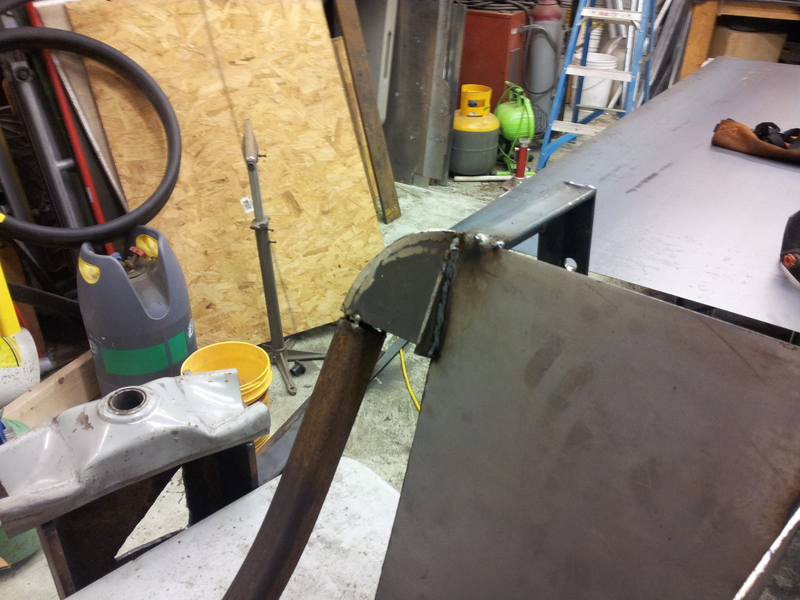 This radius is very tight, and I was worried that the steel couldn’t make such a tight radius. So I made it out of ¼” plate steel. 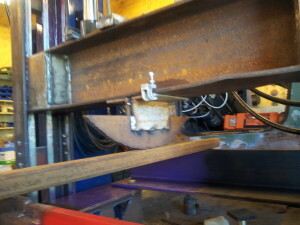 After cutting two of these plates, I welded a 1 ½” flat bar on the back of these plates to separate them. Then I rapped a 1 ½” flat bar on the front. To save on weight, I made the wheel well out of 16 gauge steel. 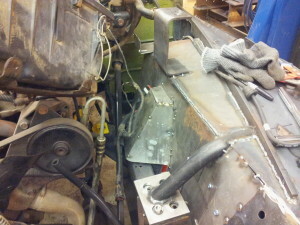 This pictures shows off the bump out that I made for the shock tower. 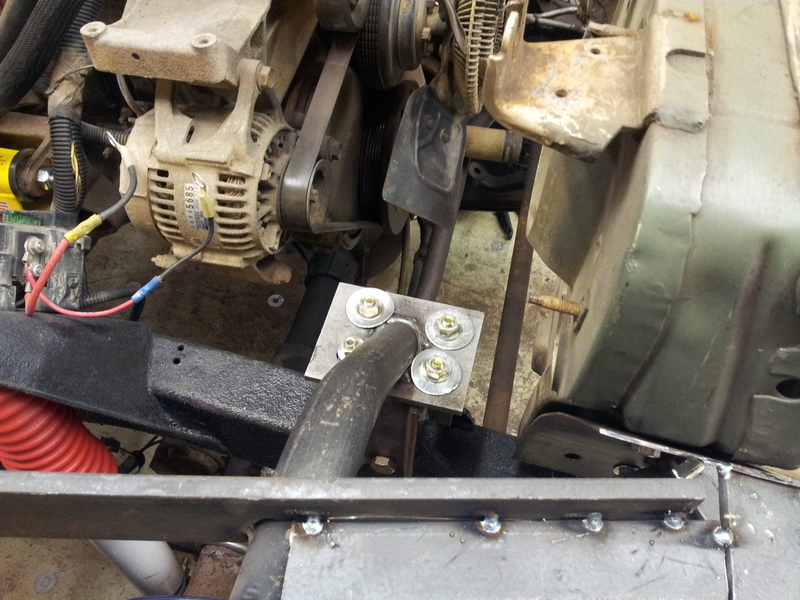 It also shows the mounts for my fuel filter and brake apportioning valve. These are in the back, corner of the wheel well. The tall mount is for the fuel filter. The fenders are skinned using sheet metal. The gauge of this steel escapes me. I think it may be 12 to 14 gauge. This picture is of the back fender being skinned, well, I guess it would be the opposite of being skinned, but you know what I mean. I used the same method here as I did with the front. I just laied the steel on top of the fender flare, and then used every clamp I could get my hands on to wrap it around the flare. 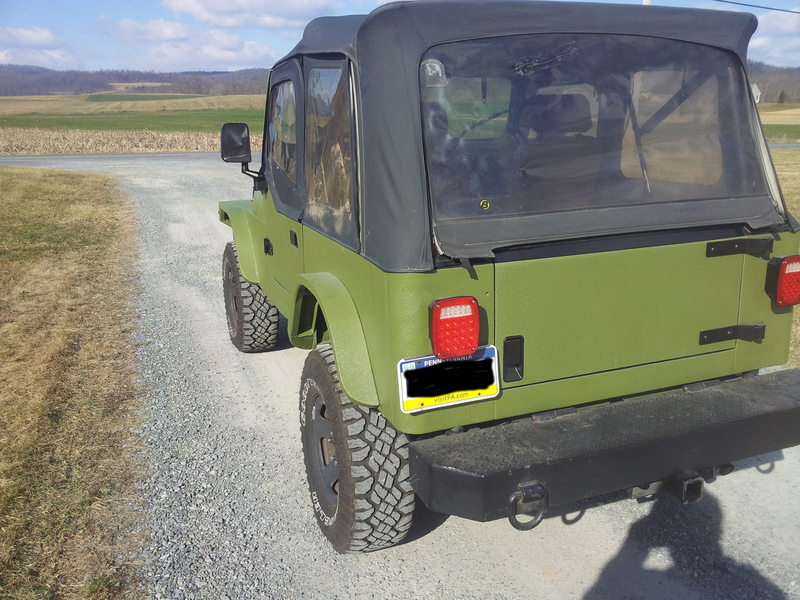 While we’re on the subject of rear fender flares, the picture above shows off the way that the front of the flare is mounted to the Jeep. It is a quarter inch thick steel. 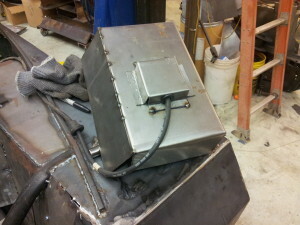 It is inserted into the fender flare radius and welded. 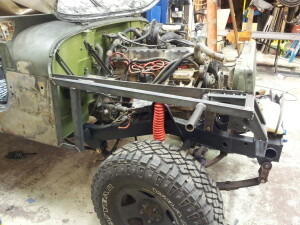 Then I cut a slot into the side of the Jeep and bolted the steel bar to the floor of the jeep. 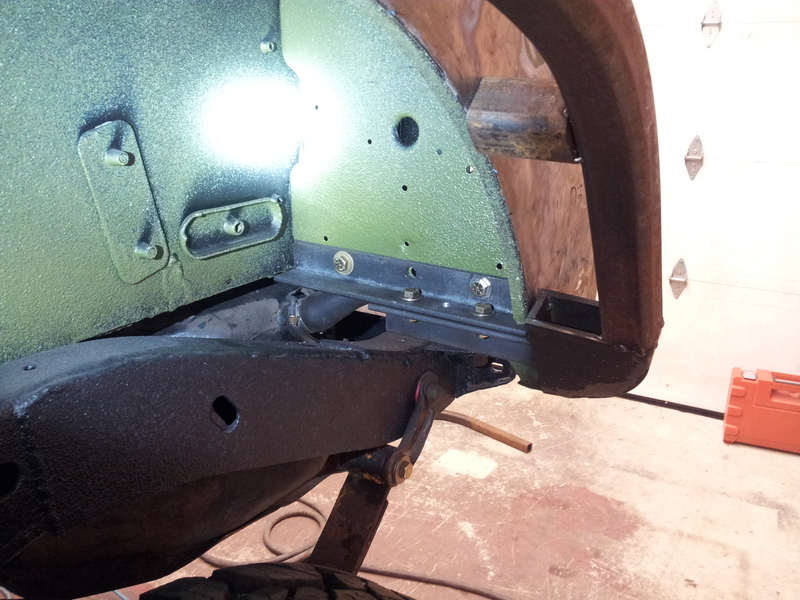 At the rear of the fender flare is a piece of angle iron welded to the fender radius. This angle iron patrudes into the wheel well. It is then bolted to another piece of angle iron which is bolted to the back of the wheel well. At the top of the rear fender flare is another mount. It is a piece of large angle iron with a bar welded in the center. 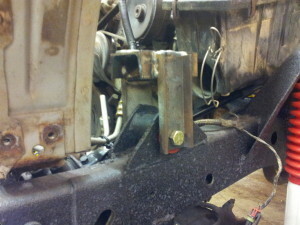 This is then bolted to the top of my wheel well with four bolts to distribute any force across the sheet metal. The fender flare is bolted to this angle iron with only two bolts since the force will most likely will be on the face of the mount. This is a shot of the front fender blinker. This is a ¾” round led side marker. I bought this side marker at superbrightleds.com. 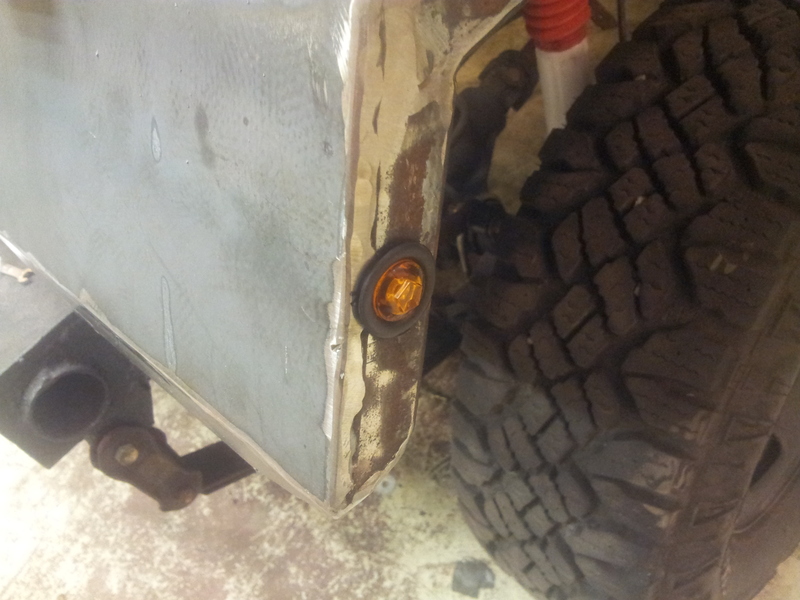 Then I jammed the light and grommet into the square tubing. The tubing was a little thick for the grommet, but, after a little persuasion, I was able to get the grommet to fit. I made the wheel well a little too big. 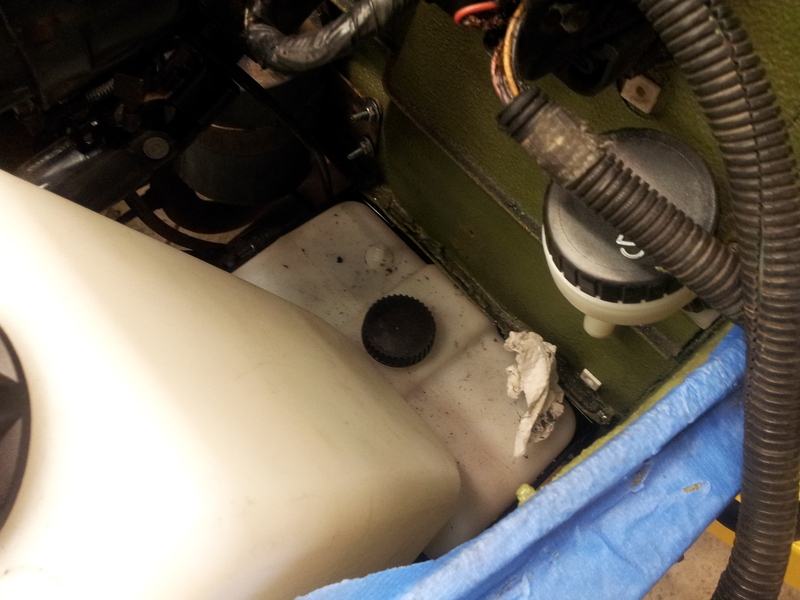 The original coolant and windshield washer tanks wouldn’t fit. So I had to get new tanks. The coolant tank is the big one on the left. This tank can hold 5 quarts. For the hose going into this tank, I just used a grommet at the top of the tank. I figured since it was vented, that if it leaked, it wouldn’t matter. The bottom tank is for the windshield washer tank. Because of the pump, I needed a water tight port on the bottom of this tank. So I got one custom made at flambeaufluids.com. To fill it, I ordered a remote filler port from the same place. You can see this on the firewall. Because the tank is pushed down so far, I made a cradle out of 16 gauge steel. Not only does this hold the tank, it will protect the tank from rocks. The hose coming poking out of this tank is the feed to the pump. The pump is attached to the side of this cradle via hose clamp.